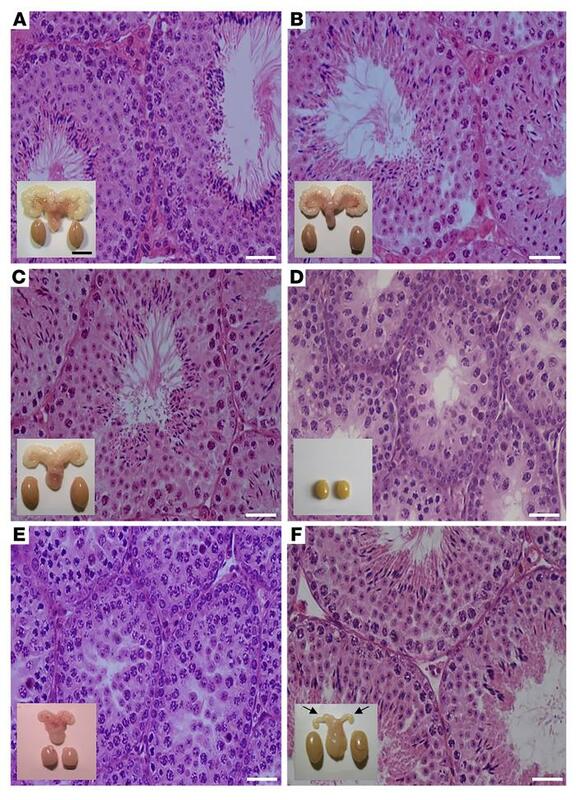 Testicular histology and macroscopic views of testes and urogenital blocks from different mouse genotypes and from flutamide-treated animals. Representative views of (A) WT, (B) Fshr-CAM, (C) Fshr-CAM/Lhr–/–, and (D) Lhr–/– mice (n = 5–8/group). A–C show normal spermatogenesis and testis and SV sizes. In D, spermatogenesis is shown as arrested at the RS stage, with small testes and rudimentary SV (not shown). (E) Treatment of WT mice (n = 5/group) with antiandrogen flutamide arrested spermatogenesis at RS stage, with reduced testis and SV sizes. (F) Identical treatment of Fshr-CAM/Lhr–/– mice (n = 5/group) had no apparent effect on spermatogenesis and testis size, but reduced SV sizes (arrows in F). Scale bars: 50 μm; 10 mm (insets).